Balustrades are the rails that keep you from falling off a balcony, staircase, or other surface. They actually consist of the top rail, the baluster, and the base rail, or plinth. Balustrades can be very utilitarian or they can be visually stunning. Stromberg GFRC specializes in visually stunning balustrades. Balustrades can curve along a staircase or be straight as an arrow around a pool. 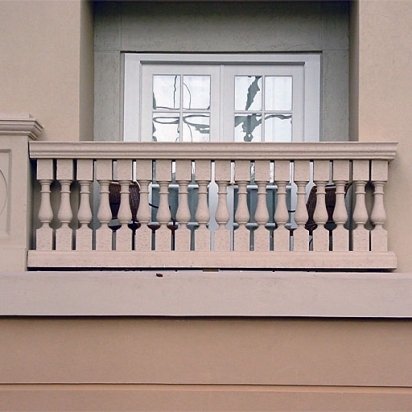 The baluster can vary in height to produce a low rail or a higher fence. The spacing between the spindles can be very close or farther apart. Stromberg GFRC has approximately 30 baluster designs for you to chose from. We also have numerous rail, plinth, and final designs. Of course, we can also make custom designs for you out of GFRC. When Stromberg GFRC installs your balustrade, we ensure that it meets all applicable safety codes. Most people are surprised to learn that there are safety codes governing the rail height and the spacing between the balusters. These are to keep children from getting their heads stuck in the spaces between the balustrades, or anyone from flipping over the rail and falling. Because GFRC is cast instead of carved, you can be assured that each baluster will be identical. The rails will also be identical. This is almost impossible with carved stone, for example. No craftsman can make identical carvings, although the best can come close. Ready to design and order your balustrade? For more information and assistance with your design challenge, please call us at (903) 454-0904 today or email us at info@strombergarchitectural.com.